Sweet Memories Is The Perfect Gift This Father’s Day! Written by Brook Reilly. June 15, 2012. My partner Russell Stephanchick and I have formed a new company developing and marketing a deck of 52 oversized cards (5 by 7 inches), called Sweet Memories. The cards pose conversational questions for use with grandparents, grandchildren, children and friends. The idea for the cards resulted from a personal experience while visiting a close friend who began a swift decline in health following a serious stroke. This particular day, she was depressed and agitated and we quickly ran out of things to talk about. On my way home, I thought, Wouldn’t it be nice if there were questions that one could reach for, that one could ask the person you were visiting? 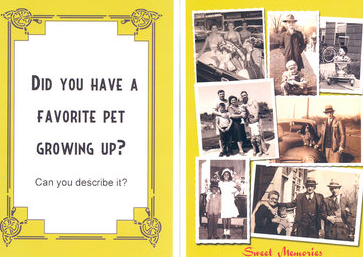 I began to write down some questions that I thought would be fun and interesting and appropriate for people of my friend’s age, who was born in the 1920's.This idea matured into the unique deck of cards and questions that we have named Sweet Memories. The cards, while appropriate and fun for all ages, may be particularly beneficial for visiting people whose independence and mobility have been compromised, including nursing home residents, extended-stay hospital patients, and people who are housebound. It might also be interesting to note that we are a true Cleveland and Cleveland Heights story and virtually everyone involved in these cards is either a life-long resident of Cleveland Heights or the Cleveland area. We have specifically recognized this story of friendship by naming our company All Together Now USA Ltd.
Be sure to visit their website here! Tags: sweet memories card, sweet memories cleveland, sweet memories usa.